JERSEY - A psychologist still needed: paranoid Noel Gallagher is always and still scared that some mad fan kills him, as John Lennon. It's ridiculous, there are thousands of celebrities and almost never happened. It's the originary reason why he used to refuse autographs and didn't want to be in photos with fans. He now accepts but moans about it, even insulting his own fans. The person telling him to accept must be the same one taking care of his attitude in public... mission: NOT complete. By the way: Noel Gallagher who? a celebrity? nah they can't kill him. I hope they don't... can you imagine: he's already GOD, if they killed him he'd become the creator of God... they'd idolise him even more. If I was a mad fan (I am), I'd kill him JUST BECAUSE he shows to be scared, he's silly. In fact, they always attacked him onstage (and not Liam). en it sprung from one of his flight cases in the lead up to a gig. The former Oasis frontman (?! it was called LIAM... who was also the founder of the band and gave the name Oasis) was headlining with his new band (?! he said it's NOT a band... and it's OLD, dying in November) High Flying Birds at Jersey Live Music Festival when the chaos unfolded backstage on Sunday, ahead of his performance. The mystery black and green arachnid, which has yet to be identified, was discovered by crew members unpacking the singer’s flight cases. 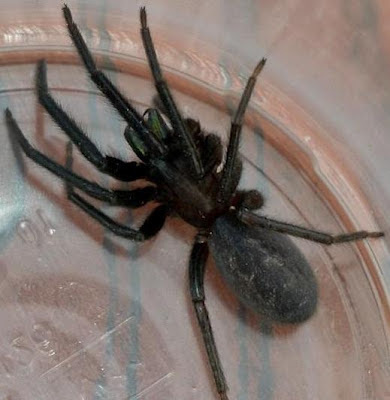 Organisers quickly caught it in a container but were so concerned the fanged spider was dangerous that they quarantined an area back stage for twenty minutes. The rock star (?! he just said rock stars don't exist anymore), whose Oasis hits include Don't Look Back in Anger - has been touring recently in exotic places including South America and Asia as well as closer to home in Europe, sparking fears of where it could have come from. Jersey Live spokeswoman, Jayne Houghton, said: 'The Jersey crew members were unpacking Noel’s flight cases when a huge black spider with green fangs came out with a flourish. 'Staff immediately set about catching the spider and an area backstage had to be quarantined for nearly twenty minutes. 'Luckily there were members of Durrells Wildlife Conservation Trust at the festival who kindly took the spider away for analysis. Twelve animal experts from Durrells Wildlife and Conservation Project had by chance been collecting drinks cans to raise money for charity when they were summoned backstage. Sarah Nugent, from the conservation project based in Jersey, said: 'We are having the spider analysed at the minute. 'We found out that the crew had been to most parts of the world during their tour, including Argentina and Japan. Sarah added: 'We were really lucky because we got taken back stage, which was great for us, and the crew had already put the spider in a plastic container. 'It was the size of a 50p piece with green fangs. We used the teams laptop to see if we could Google what the spider was. Noel Gallagher headlined at the annual festival at the Royal Jersey Showground in Trinity, Jersey, yesterday with his Manchester-based (?!? they're not from Manchester) rock band (?!? piano bar cabaret band) High Flying Birds, which formed last year.